NHL: Ville Leino scored in the sixth round of the shootout and the Philadelphia Flyers clinched a playoff spot with a 3-2 victory over the host Dallas Stars on Saturday night. Claude Giroux had a goal in the second round for the Flyers, but Mike Ribeiro tied it for Dallas in the third round with a nifty hesitation move. 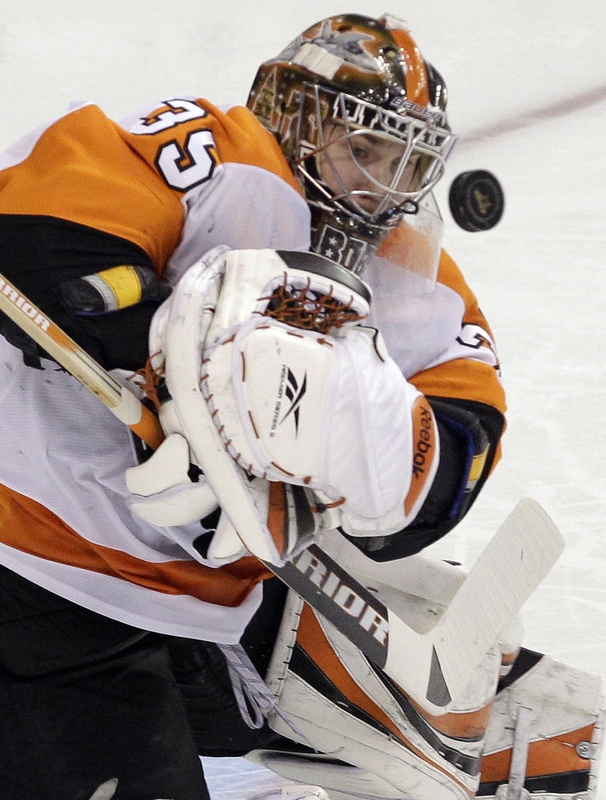 Jeff Carter and Mike Richards scored goals in regulation and Sergei Bobrovsky made 28 saves for the Flyers. • Grabner reaches 30 goals in Islanders’ win: Frans Nielsen and P.A. Parenteau scored in the shootout to lift the New York Islanders to a 4-3 victory over the Florida Panthers in Sunrise, Fla. Rookie Michael Grabner (Spokane Chiefs) netted his 30th goal and Rick DiPietro finished with 29 saves through overtime for the Islanders. NBA: Ray Allen scored 20 points, including the clinching free throws with 2.8 seconds left, and the Boston Celtics rallied to beat the Hornets 89-85 in New Orleans. Allen also had a key offensive rebound that led to Glen Davis’ two foul shots that made it 87-83 with 15.2 seconds remaining. Davis also had 20 points. • Matthew powers Portland past Philadelphia: Wesley Matthews had 17 of his 28 points in the first quarter, helping the Portland Trail Blazers beat the Philadelphia 76ers 110-101 at home. Men’s basketball: John Nance scored 10 of his 16 points during a game-changing 34-5 burst early in the first half and St. Thomas beat Wooster (31-3) 78-54 in Salem, Va., to win its first Division III men’s basketball national championship. Tommy Hannon also scored 16 points for the Tommies (30-3), whose run gave them a 36-16 lead less than 15 minutes into the game. Wooster knocked Whitworth out of the tourney last week. Golf: One last birdie gave Justin Rose another 65 and the lead by himself in the Transitions Championship in Palm Harbor, Fla.
Rose became the first player in tournament history with consecutive rounds of 65 at Innisbrook, and it gave him a one-shot lead over Brendan de Jonge and Webb Simpson going into the final round. Rose was at 13-under 200, one short of the 54-hole tournament record. • Stanford leads LPGA Founders Cup: Angela Stanford opened a three-stroke lead over Brittany Lincicome in the LPGA Founders Cup in Phoenix, shooting her second straight 6-under 66. Wendy Ward of Edwall, Wash., sits at 1-under 143. Wrestling: Penn State, led by 184-pound champion Quentin Wright, won its first NCAA wrestling title in 58 years by outpointing Cornell. The Nittany Lions finished with 1071/2 points to the Big Reds’ 931/2. Wright began the tournament as the ninth seed and won his first national title with a 5-2 decision over Lehigh’s Rob Hamlin. Boise State’s Adam Hall (Bonners Ferry) was defeated 5-0 by American’s Steve Fittery in a third-place semifinal match. Tennis: Australian Open champion Novak Djokovic outlasted Roger Federer 6-3, 3-6, 6-2 to stay undefeated this season and reach the BNP Paribas Open final at Indian Wells, Calif.
Djokovic will play top-ranked Rafael Nadal in today’s final. Nadal rallied from a 3-0 deficit in the first set to beat Juan Martin del Potro 6-4, 6-4. On the women’s side, top-ranked Caroline Wozniacki plays 15th-seeded Marion Bartoli in today’s final. Miscellany: Jon Jones, 23, knocked out light heavyweight titleholder Mauricio “Shogun” Rua in the third round at Newark, N.J., becoming the youngest fighter to hold a UFC championship belt. In the co-main event, former WEC featherweight champion Urijah Faber won his debut under the UFC banner with a unanimous decision over former WEC bantamweight champion Eddie Wineland. • Kostelic adds slalom title: World Cup overall skiing champion Ivica Kostelic added the slalom title and Guiliano Razzoli won the final race with a two-run time of 1 minute, 25.72 seconds in thick fog at Lenzerheide, Switzerland. Kostelic placed 18th, but his closest rivals failed to take advantage. Kostelic was the runaway winner in the overall standings. • The Factor issues win at Rebel Stakes: The Factor, the 3-year-old son of Warfront, turned the $300,000 Rebel Stakes at Oaklawn Park in Hot Springs, Ark., into his third consecutive wire-to-wire victory, blazing through the 1 1-16 miles in 1:42.19, a stress-free 6 1/4 lengths in front. The $1 million Arkansas Derby on April 16 could be his next start. • Officials brace for Fiesta Bowl findings: Fiesta Bowl officials in Scottsdale, Ariz., are bracing for what could be a scathing report from an internal investigation of the event’s financial and political dealings, some of which may have skirted, or even broken, state and federal law.